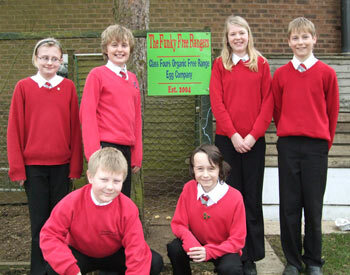 In 2004 the older children in our small village primary school (Staverton Primary School, Northants) started a free-range egg business called “The Funky Free Rangers” in the school grounds. They began with an ark and eight hybrid hens bought from a local poultry centre. Five years later and the hens are still here in a long permanent run down the side of the school drive and the children have a successful business. 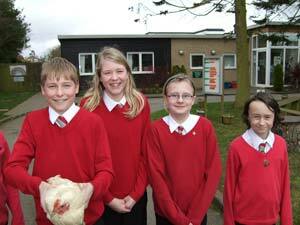 To begin with the children sold shares in their business to raise the money to buy the hens, ark, feed and equipment. Two hundred £1 shares were sold to parents and governors in blocks of ten. This represented twenty percent of the business, so twenty percent of the eggs are given to these shareholders as a dividend based on the quantity of shares they own. Once the money was raised we negotiated a reduce rate with the poultry centre with the promise of good publicity in the local paper. In fact the hens and children have ended up on radio and TV as well as a national magazine! 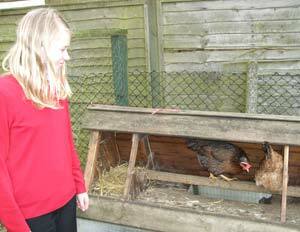 The children began with a rota so children collected and sold the eggs, fed the hens and mucked out on a regular basis. They have recently re-organised themselves into Sales Team, Poultry Hygiene, Stock Control and Finance so children now specialise in their preferred area. The ark has become a fixture with a run constructed around a line of fir trees that grow down the side of the school drive which give the hens some natural cover. In addition to keeping the hybrid egg layers the children have an incubator and hatched a range of rare breed poultry last year including Marans, Light Sussex and Poland bantams. These have gone to live on the headteacher’s smallholding once out of the brooder. In terms of the curriculum, Ofsted rated the children’s knowledge of economic well-being as outstanding and the project is used as an example of good practice in four other European countries. Perhaps more importantly the children really enjoy looking after the hens! Please leave a comment below if you’re keeping chickens at school, we’d love to hear how you’re getting on!